A spiegeltent (Dutch for "mirror tent", from spiegel+tent) is a large travelling tent, constructed from wood and canvas and decorated with mirrors and stained glass, intended as an entertainment venue. Originally built in Belgium during the late 19th and early 20th Centuries, only a handful of these spiegeltents remain in existence today, and these survivors continue to travel around Europe and beyond, often as a feature attraction at various international arts festivals. Two tents used by Teatro ZinZanni have been in (more or less) fixed locations in Seattle and San Francisco for several years. On 1 April 2011, Spiegelworld opened Absinthe at Caesars Palace, Paradise, Nevada in the 26 metre Salon Marlene. In 2007 the first spiegeltent arrived in Africa and is touring South Africa as part of Madame Zingara's Theatre of Dreams dinner circus extravaganza. The original spiegeltents were constructed in the Flemish Region of Belgium in the late 19th century as mobile dance halls. They were transported around the country and assembled for town fairs in areas that did not have a proper dance hall. Palais Romantique - an Art Deco spiegeltent which is 17 metres in diameter and holds 300 people. Palais Nostalgique - 1920 currently used for a standing show in San Francisco, California. Holds 295 people. Le Moulin Rouge - 1910 currently used for a standing show in Seattle, Washington. Holds 295 people. La Gayola - an Art Deco spiegeltent 1947 which holds 350 people. Ideal - an Art Nouveau spiegeltent, handmade 1948, which holds 320 people. Idolize - One of a kind spiegeltent in Baroque style with a capacity of 450 guests. Parel van Vuren - Holding up to 350 people and 18 metres in diameter. Built by Belgium's renowned Klessen family in 1905. Aurora - holding up to 800 people and 24 metres in diameter. Art Deco. Palais des Glaces, 22 diameter, Art Nouveau 1992. Capacity: Up to 300 people. Bon Vivant - Nostalgic dance hall in Art Nouveau style. Kempisch Danspaleis - mirrored dance tent. Cristal Palace - 18 metres in diameter for up to 400 people. Carrousel - Interior in oak. Capacity : up to 300 people for dinner. De Lust - A rectangular mirror tent for up to 500 people. Salon Perdu - 20 diameter in Jugendstil stile; holds up to 550 people. Deluxe - One of the smallest spiegeltents. Capacity: 225 guests. Victoria - One of the most luxurious mirror tents. 25m diameter, 1000 people standing, 600 seated and 420 seated for dinner. The Famous Spiegeltent, perhaps the most lavishly decorated of all, was built in 1920 in Belgium by master craftsmen Oscar Mols Dom and Louis Goor. Over the decades it has hosted some of the world's greatest performing artists, including German singer Marlene Dietrich, who famously performed "Falling in Love Again" in it during the 1930s. The Famous Spiegeltent is transported from venue to venue in shipping containers, and is constructed on site at each location. It consists of about 3,000 pieces of wood, mirrors, canvas and stained glass, and is then detailed in velvet and brocade. Construction takes about twelve to sixteen days, and is supervised by owner, David Bates. In addition, an adjacent bar is constructed, which in addition to the lighting and sound equipment takes another few days. The Famous Spiegeltent can hold an audience of about 316 people. 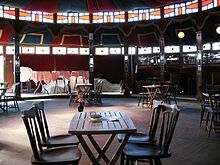 The Famous Spiegeltent is owned and managed by Australian pianist and theatrical producer David Bates, who first utilised the tent as a venue at the 1996 Edinburgh Festival Fringe. After a successful visit to Melbourne in 2001, Bates bought the tent from previous owners Scottish & Newcastle and set it up as a unique travelling venue. ^ "Teatro ZinZanni Seattle". Teatro ZinZanni. Retrieved 20 July 2013. ^ "Madame Zingara". Madame Zingara. Retrieved 15 January 2014. ^ a b c d "Spiegeltent of van Rosmalen en Zonen". Vanrosmalen.com. van Rosmalen en Zonen. Retrieved 27 February 2014. As of 18 August 2017[update], they manage a total of eight Speigeltents. ^ "Inside the Spiegeltent". Retrieved 3 February 2017. ^ "Theatre of Dreams". Madame Zingara. Retrieved 15 January 2014. ^ "The art of moving Madame Zingara's 38 t dreams tent". Engineering News. 19 August 2011. Retrieved 15 January 2014. ^ "Spiegeltent Victoria". Retrieved 15 January 2014. ^ "The Famous Spiegeltent History". Spiegeltent.net. 13 July 2010. Retrieved 20 July 2013. 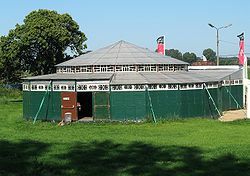 Wikimedia Commons has media related to Spiegeltents. This page was last edited on 17 October 2017, at 14:49 (UTC).